Planting blue spruce tree is rewarding; it is an attractive native American conifer, read below to know more about blue spruce care and growing. Colorado Blue Spruce (Picea pungens) is a beautiful native American conifer. 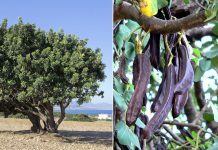 This extremely rustic silvery blue tree reaches the height of 9 – 21 m (30-70 ft) in its region of origin. Nice bluish green color, accentuated by the sharply pointed foliage makes it a perfect conifer for open landscapes and large backyards. 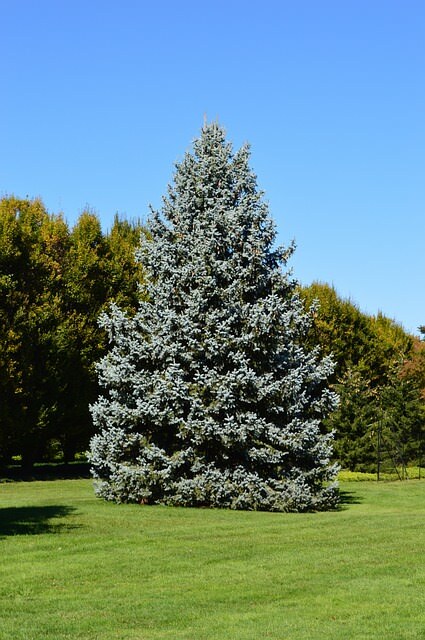 Dwarf forms of blue spruce are also available that reaches only between 1.5 to 4.5 m (5-15 ft) tall and are suitable for small gardens, patios, and terraces. This pyramidal conifer has a habit of growing slowly. Its persistent and fragrant needle-like bluish green foliage are densely distributed around the reddish gray twigs. These needles are stiff and sharp. Other Names — Blue Spruce, Green Spruce, White Spruce, Colorado Spruce or Colorado Blue Spruce and Picea Pungens. Blue spruce is usually propagated by cuttings, graftings, and seeds. 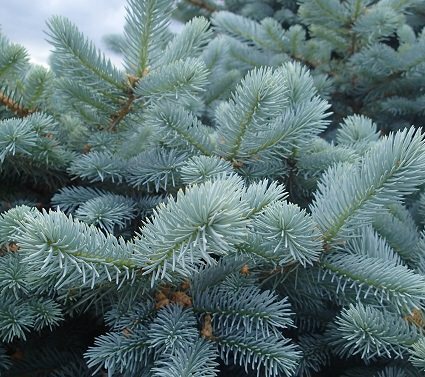 Blue spruce cuttings are collected, preferably in the morning from vigorous branches. These cuttings should be dipped in a rooting hormone before planting in containers in a mixture of peat and sand. After planting keep the cuttings in a bright spot and keep the growing medium moist. These cuttings take a long time to show signs of growth, and you must wait several months, and the success rate is also poor. Once the cuttings show growth, plant them in the right place. Air layering of the blue spruce tree is also possible. Only mature blue spruce trees produce the cones. These cones drop their seeds in spring. Blue spruce seeds require a considerable period of light to germinate: 14 to 16 hours per day. If the length of light falls below 12 hours a day, they become dormant. Seedling Growth of blue spruce is also very slow, and you need to be patient. If you are planting a blue spruce tree, our recommendation is to buy a plant from nursery so that you’ll not have to wait for that much long. Planting a blue spruce tree on location in moist soil with full sun to light shade is optimal. However, blue spruce trees can tolerate less than perfect conditions but growing them in a heavily polluted area can affect the blue color coating of the needles. Blue spruce tree care involves a few requirements and slight maintenance to keep it healthy and vigorous. Soil should be well-drained and rich in organic matter. You can add compost while planting. 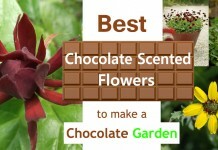 It is also required to keep the soil slightly moist when the plant is young as mature trees can tolerate dry soil. Conifer fertilizer is expensive (like 30-15-15 with minor elements) but very effective especially if your soil is sandy. 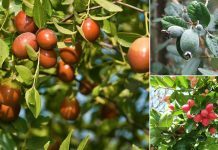 These fertilizers will give all the nutrients and help the tree growing vigorously with a nice look and much denser foliage. Regular watering is required for the young plant. Once established, watering must be abundant but infrequent only during the dry spells. All conifers need a vital water supply in the fall before frost to accumulate reserves; this allows them to withstand the sun’s rays in March when plants still have their feet in the gel, causing called spring burn. Planting area around this magnificent conifer should be kept clean and weed free, especially when the plant is not well established. A good thick cedar mulch or of other organic matter is sufficient to prevent annual weeds. Do not prune these trees. They do best when their branches are allowed to grow all the way to the ground. Use a magnifying glass to examine the needles of your blue spruce for signs of Rhizosphaera needle cast (Rhizosphaera kalkhoffii), a fungus that causes needle cast disease. It pushes through the stomata of the affected needles and looks like fuzzy black spots. If not treated, blue spruce needles turn purple to brown and eventually fall. Although, the fungus doesn’t usually kill the tree. Besides this blue spruce trees are also susceptible to white pine weevils. My tree was transplanted by me from PA to an old ho use in NJ. It is gorgeous and perfect. I do have invading day lillies around some of the tree that faces all day sun. i think I should remove these this spring since reading your article. I will begin deep watering now for the coming winter and hopefully get some fertilizer before spring. It has always been the most important part of the front yard and is huge! My birds love to hide in the top branches. I planted a Blue Spruce last year at Christmas time and this fall it died. I don’t know what killed it but all the needles turned brown and it was dead in a month. Before that it had new shoots on each limb and really looked like it was going to flourish. Mine is doing the same thing, needle drop only on one side so far. Nursery says water more and spray for spider mites. Did you ever find out why your tree died? Still hope to save mine, we’ll see. We had the same problem. We are in Utah. There are three main problems we face here with spruce. The one that killed our tree was fungus. A spruce specific fungicide has worked nicely for us since we planted our new one. Two other common problems are mites and borers. There are easily accessible products on the market at your local hardware or IFA for all three of these problems. You will have to be diligent in application and follow manufacturer directions.